Náttfari, the band, not the folklore, were formed in 2000 and quickly became Icelandic favorites, receiving rave reviews for live shows including a New York Times piece calling them “mind-blowing.” Then, despite an eight year break, they returned in 2011 to pick up where they left off. They did too, and were named as one of the outstanding performances at that year’s Iceland Airwaves festival. Náttfari’s music can be described as dreamy post-rock, with powerful drums and dynamic instrumentation, and the good news? 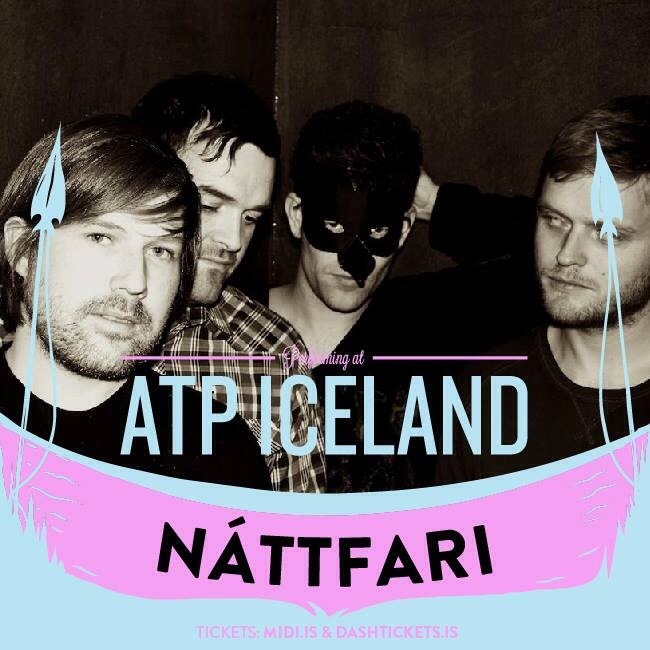 They’re about to okay at this year’s ATP festival in Keflavík in July. Halli from the band stops by to answer a few questions. Who or what are Náttfari? Náttfari is made up of a group of childhood friends. We have been playing music together in some form on and off since the late nineties. We formed Náttfari in 2000 and set out to experiment with sounds and rhythms within a conventional rock song frame, keeping with melodies and “conventional” beats but also experimenting with soundscapes, adding some different flavors to the music. I guess we wanted to try out new things and try not to sound exactly like somebody else. Where does the name ‘Náttfari’ come from? Náttfari was a slave that fled from the first settler who came to Iceland and lived in refuge in Náttfaravík in the north of Iceland. The word ‘náttfari’ means “someone who travels by night,” sort of a dark name really. I guess our music is a bit dark so the name fits nicely. Our music is a bit dark and perhaps melancholic but also powerful and dynamic. The beats are often fast and vivid, and we have different melodies going on in the guitars, keyboards and bass. People see a connection to post rock and I guess that’s reasonable, we were very influenced by that genre, and our music is instrumental. However, there are a lot of other influences going on, for example from electronic music, grunge, experimental rock, jazz, and so on. We listen to a wide range of music so the influences come from various directions. You disappeared for a while, but have now returned. What did you get up to? A couple of us went to play with the Leaves, another Icelandic rock group, one of us started a solo career and one went to university. We felt it was time to start playing together again. It had been a long time since we played and we simply wanted to get together, finish our long awaited album and continue writing new music. You are playing at ATP Iceland. What can we expect from your live show? You can expect a powerful rock’n’roll performance. We’ll be playing some new material, most of which is pretty upbeat and loud, but good! Who are you looking forward to seeing at ATP? There are so many good bands playing ATP. We are big Slowdive fans, so we are really looking forward to that, but also Portishead, Interpol, Devandra Banhart, Kurt Vile, Samaris and Low Roar to name a few. What future plans are there for Náttfari? Are you sticking around this time? Right now we are planning to record an album, perhaps an EP, perhaps a full album, and probably we’ll do some more shows this year. We’ll probably never quit making music together, but we’ll be taking our breaks and then surface every now and again with some new material. « I won a MIBBY!